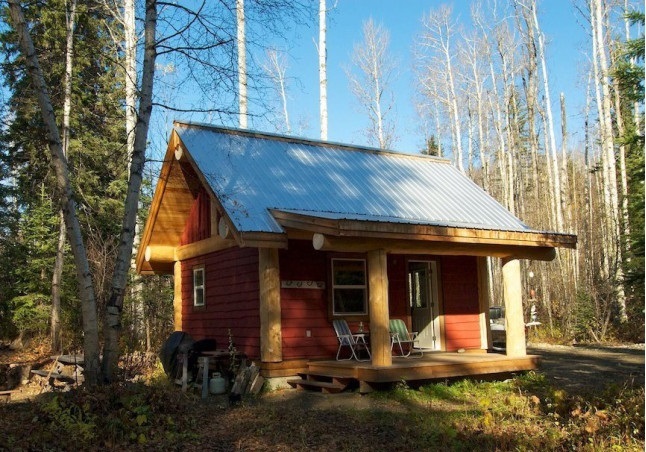 Providing small cabin power when you live off-grid involves several different elements normally provided by your local power company: production or power generation; storage; and delivery or conversion. There are several options here and we’ll look at each of them in turn. I like to approach a small cabin like a boat. Although you can use a portable generator, the best approach is to set up your own stand-alone energy system using solar power, wind or micro-hydro; a battery bank and an inverter. Before you can delve into the small cabin power source options, it’s a good idea to determine some numbers that approximate your small cabin energy needs. Otherwise, you’re working blind, making guesses as to how much power you need to generate and whether that’s even feasible. I’ll take a guess and say that most small cabins will probably fall into a range of around 100-200 amp-hours per day. Your choices for power generation boil down to a portable generator or a renewable energy source. Each choice has pros and cons. A portable generator can run high loads and charge batteries quickly, but is loud and expensive. Renewable energy is clean and quiet, but requires more investment in the setup. The easiest option would be to simply purchase a portable generator, whether diesel, gasoline or propane driven. Most propane-powered generators are also dual (or even tri-) fuel, meaning you can also burn gasoline (or natural gas). The obvious limitation here involves having to maintain a fuel source at your cabin. You could also have the generator running a high-output alternator for charging a battery bank. This way you would only need to run it for a short time as needed. Generator Joe is an excellent resource for calculations involving hp, BTUs, energy conversion and propane sizes. The other drawback to using a portable generator is the noise and smell that comes from running this full-time. You don’t go off-grid into the woods in order to listen to a noisy generator hammering away. However, this is a viable option for powering tools when building your log home or cabin. There are several options when you consider renewable energy for your small cabin power source. Off-grid power generally comes from three different sources, each of them clean, green and free once past the initial capital costs. The best setup would be to include more than one of these methods of harvesting free energy in a hybrid approach that will keep you in power no matter what the weather or season. Solar panel installation is pretty straightforward since you just have to install the panels and wire them up to the battery bank. But it’s also important to include a charge controller that regulates the incoming charge from bulk to float. 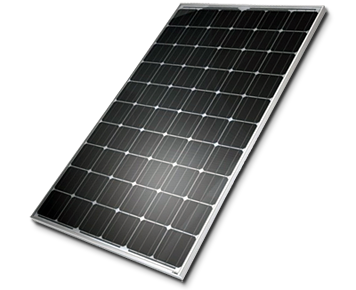 Solar panels have been dropping in price over the years and there is a huge range of panels available. Performance warranties on solar panels typically last between 25 and 35 years. A 100-watt panel under ideal conditions will generate 100 watt-hours of electricity each hour in ideal sunlight and a 200W panel will generate 200 watt-hours each hour, so you can expect to pay about double the price for the 200W panel. Monocrystalline silicon - these offer both high efficiency and good heat tolerance but are more expensive. Better for space-constrained installations where the higher efficiency is more important. Polycrystalline silicon (also known as multi-crystalline) - these are lower-priced but also have lower efficiency, although this is constantly improving. Generally the more popular choice for off-grid, small cabin applications. Amorphous (or thin-film) silicon - these are the least efficient so need more mounting space; can be difficult to install and less durable. But they can be made flexible, which opens up potential applications, and high temperatures and shading have less impact on the panel performance. The optimal situation would be to have your solar panels following the sun as it traverses the sky, but since you have a fixed array the best direction is true south (in the northern hemisphere). This is another consideration to bear in mind depending on how your cabin is situated. If you’re using a compass to orient the panels, you need to take magnetic variation into account so you’re not pointing at magnetic south. For summer, multiply your latitude by 0.92, and subtract 24.3 degrees. For spring and autumn, multiply your latitude by 0.98, and subtract 2.3 degrees. For winter, multiply your latitude by 0.89, and add 24 degrees. If you’re just fixing your solar array in one position and leaving it, choose the season where you use your small cabin the most and use that tilt angle. Once you have determined your energy needs you can see what size system is needed and whether your local winds can provide sufficient small cabin power. Experts recommend that small wind turbines be mounted at least 30 feet above nearby obstructions, such as trees. For a small cabin situation this can be difficult. 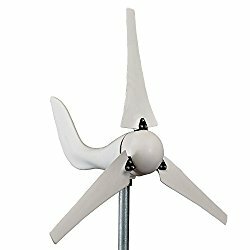 Wind power for a small installation isn’t cheap. Typical costs range from $4000-$9000. And most small wind turbines do not perform quite as well as their manufacturers would lead you to believe. Power available from the wind is proportional to the cube of the wind speed. In other words, if the wind speed doubles, the power available from the wind increases by 8 times. You’re better off if you have varying winds that die off but that blow hard occasionally than if you live somewhere where the wind blows constantly, but only lightly. Where W is the power in watts, A is the area swept by the turbine blades in square feet, and v is the wind speed in miles per hour; and A = π r². Although this suggests an exponential increase in wind power as wind speed increases, the actual power increase is more linear than is predicted because a wind turbine is not perfectly efficient. Boats regularly use small wind generators that can be mounted on a pole and swivel easily to face into the wind. This is probably the best option to use for a small cabin power source, and you need to look very closely at the numbers to determine if there is sufficient wind to justify the cost. This is best thought of as a supplement to solar for a hybrid system. This is the least common of the renewable energy sources. Very few people are using micro hydro power but if you have access to moving water this can be a good option for your small cabin power sources. It is efficient and reliable, although you may experience seasonal fluctuations due to changing water flow. Vertical Drop - Also known as head, this is the vertical distance the water falls through the water turbine. A drop of as little as two feet will generate electricity. Flow - This is how much water runs through the system. As little as two gallons per minute will generate electricity. Where P is the power in watts, H is the head in feet, and F is the flow in gallons per minute. 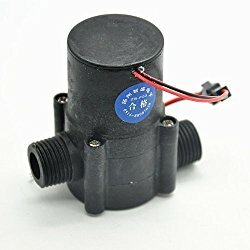 As an example, if you’ve measured the flow of your stream and determined that you are getting 20 gpm and you can pipe the water such that you have a drop of 30 feet, then you would be able to generate roughly 50 watts. Over an entire day you would generate 1200 watt-hours or 1.2 kWh. Here we’ve looked at three options for small cabin power generation. Living off the grid requires you to be self-sufficient. That means providing your own power source, along with energy storage, and delivery or power conversion. One option is to think of your small cabin like a boat and use some of the same power generation and battery banks that they use.